Okay.. we already learn about Distance vector routing protocol (RIPv1&2). and now we will start with EIGRP. EIGRP is an Enhanced from IGRP and this protocol was cisco proprietary. Ok let’s start to learn EIGRP. But wait.. why we start from EIGRP, not the IGRP. Nowadays people already leave IGRP. They are already migrate to EIGRP. That why we skip to learn about IGRP. But don’t worry, I will tell a little about IGRP before we learn more about EIGRP. So let say, what is the difference between IGRP and EIGRP? good question, First IGRP and EIGRP use different Algorithm. IGRP using Bellman-Ford, otherwise EIGRP using DUAL algorithm. Second, IGRP are clasfull routing protocol, EIGRP are classless routing protocol. IGRP using Periodic Update every 90 second, otherwise EIGRP using Bounded Update. Sometimes EIGRP is also being called “Hybrid Routing Protocol) because this protocol have a surplus in Distance Vector Routing Protocol (DVRP) and Link State Routing Protocol (LSRP), although EIGRP is being catagorized to DVRP. => EIGRP using 3 Update type to update the Routing table information (Bounded, Triggered, Partial). => EIGRP using DUAL (Diffusing Update Algorithm) to count metric. The main function of DUAL is to prevent routing loop. 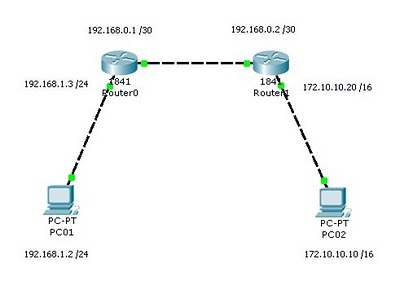 => EIGRP had 3 table :Routing table, Topology table, and Neighbor Table. => EIGRP had authentication Feature. The Advantages EIGRP than the other routing protocol. - Neighbor table : Information directly connected network that join EIGRP. 1. Hello Packet => to establish connection with directly connected network and maintain those connection. 3. Query Packet => to ask another router about the location network if there are some network down. 5. Acknowledge Packet => to ack all EIGRP packet except Hello packet. To understand more about EIGRP, let us start below exercise. I will not explain how to set the IP address and etc. I assume you already understand. If you don’t understand how to set IP, you can see back in my previous post. After set all IP address, first we go to Router 0. After that u can try to PING each other PC in those network to make sure the network is already connected each other.